Before my Maldives trip, I stopped by Watsons to pick up a new tube of Neutrogena Ultra Sheer Dry-Touch Sunblock SPF30 (88ml). This had worked very well for me during my honeymoon in Honolulu last March and my skin didn't tan at all. I briefly considered splurging on more expensive Japanese brand sunscreens like Allie which have a much lighter, watery texture but these were just too expensive at around 3000yen (S$45) for a 60ml bottle, whereas the Neutrogena sunblock was only about S$14. 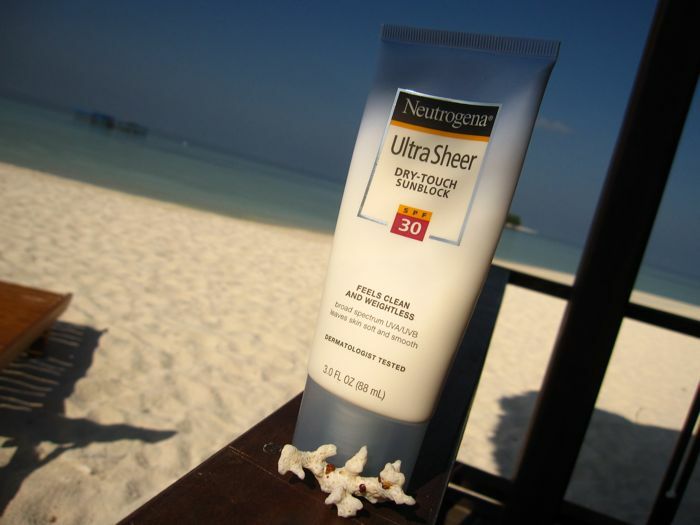 The Neutrogena sunblock is supposed to be waterproof, sweatproof, non-comedogenic and non-oily with a light fresh scent. Parsol 1789 provides broad spectrum protection against both UVA and UVB rays. While the sunblock does live up to its Dry-Touch name, unfortunately it failed to adequately protect my skin against the blazing sun of the Maldives. We usually spent about one to two hours on the beach or swimming each day and I slapped on the sunblock liberally before going outdoors. By the second day, I had a burn on my arms and legs with a smattering of small red dots on my legs. Fortunately, my face and neck didn't burn thanks to the Body Shop Shiso BB Cream SPF25 that I was using. Following the trip, my arms and legs are much more tanned than before and it will probably take a few months of minimising sun exposure to get my skintone back to its original state. The skin on my legs felt tight but at least there was no peeling and flaking. One week after the trip, most of the small red dots have faded but some still remain. A small section of the top of my scalp, near the hairline, also got burnt and I had to deal with pieces of it literally peeling off, like giant pieces of dandruff. I suspect that the reason why the Neutrogena sunblock didn't work well for me this time was maybe because I went swimming, whereas I didn't in Honolulu. Even though I re-applied the sunscreen right after swimming, I still got sunburnt. By the end of our 3 day trip, we had almost finished the tube so it probably wasn't a case of not applying enough sunscreen. Next time, I'll probably choose a sunblock with a higher SPF. For the face, I usually pick a sunblock that is a light lotion which is less likely to clog the pores than a creamy formula. 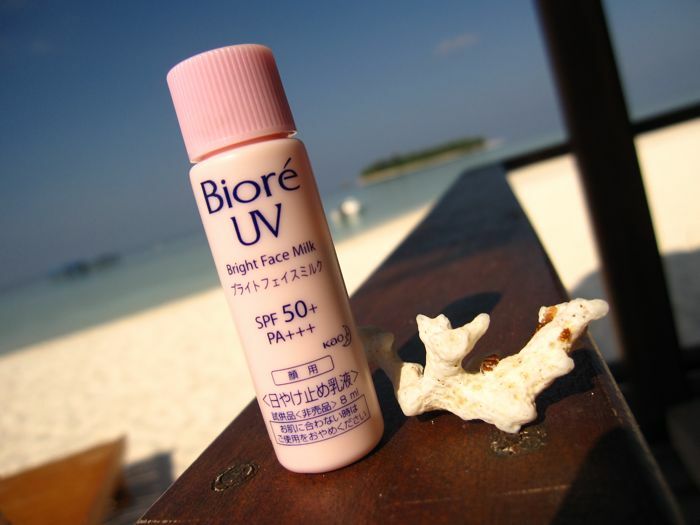 On this trip, I used a sample tube of Biore UV Bright Face Milk SPF50 PA+++ on my husband and occasionally on myself. 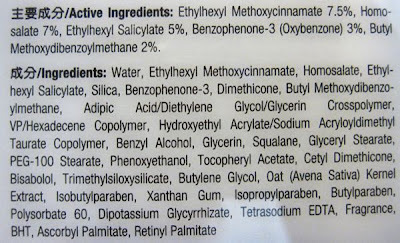 Below is the ingredients list. As you can see in the pics below, the Biore UV Bright Face Milk has a more watery texture compared to the Neutrogena sunblock. The light pink lotion is a boon for oily skintypes like mine as it dries quickly to a slightly powdery finish and adds a very subtle glow to the skin. It also absorbs faster than the Neutrogena sunblock without any whitish cast. As sun damage is a key cause of skin ageing, do remember to ensure that you have adequate sun protection before spending prolonged periods outdoors. For me, that will mean bringing a hat and a sunblock with higher SPF to the beach in future! I have heard so many good things about Neutrogena's suncare products, but the thing that always stops me from ordering (can't get this brand in my country) is that there is no information on the website or in most reviews about what kind of PPD you are actually getting. I find this very annoying. 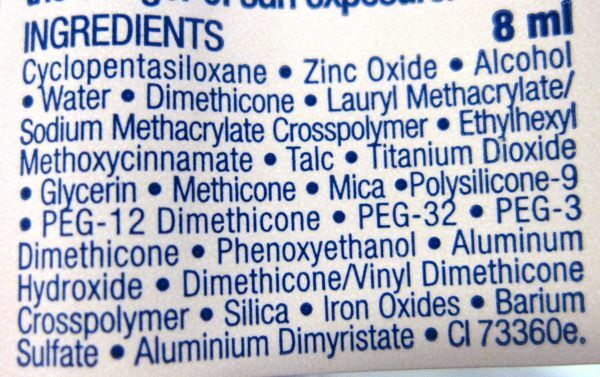 After emailing both Eucerin & Olay (no proper reply yet) this month, I'm tempted to not venture away from my La Roche Posay products- which come PPD rating and quite detailed information about the product in different languages. I really dislike how so few brands actually like the PPD though. I feel that the consumer is getting tricked into a sense of comfort & security that their high SPF sunscreens give good UVA protection as well, even though many times it's not even PPD10 (which is the recommended every day amount by many dermatologists). I agree, that's why I prefer Japanese brand sunscreens as they have the PA rating but given the situation in Japan now, I'm not sure how Japanese beauty products are going to be affected. 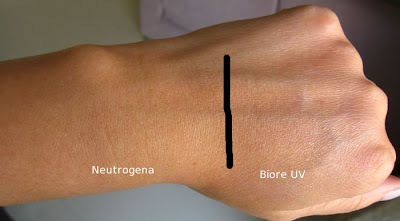 The Neutrogena sunscreen you were using is actually not photostable so unless you remove then reapply every 1-2 hours, it's not only absolutely useless but also harmful to the skin........ hence the result you got. I disagree, I have used the Neutrogena sunblock on several occasions before where it helped to prevent my skin from burning and tanning but these were all situations in which I did not go swimming. The reason the SPF 30 didn't work is because the sunscreen is not water-resistant, but its worst crime is that it is unstable. 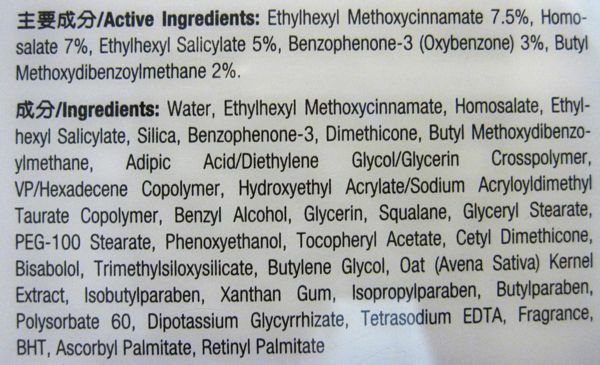 It pairs Ethylhexyl Methoxycinnamate (Octinoxate) with Butyl Methoxydibenzoylmethane (Avobenzone) without any stabilisers like Octocrylene or Tinosorbs. 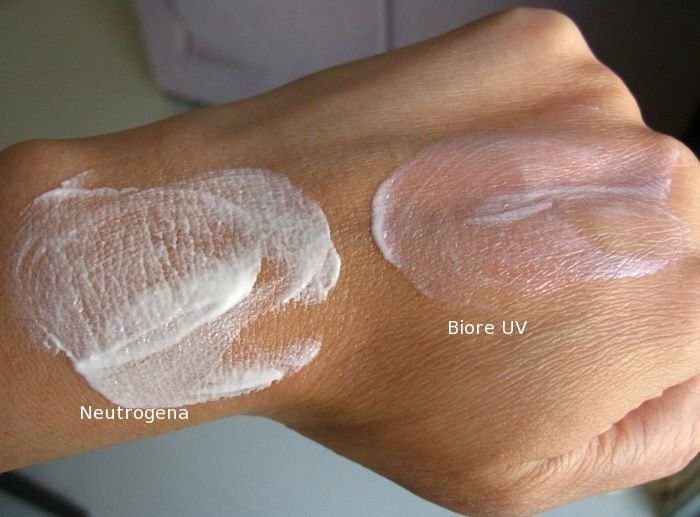 This means that the Avobenzone, the main UVA filter, degrades very quickly in the sun and you have to keep reapplying to even get any protection. The worst part of this is that UVA damage is often "hidden" and doesn't surface as a sunburn or tan, but as wrinkles and sun damage as the damage gets worse. 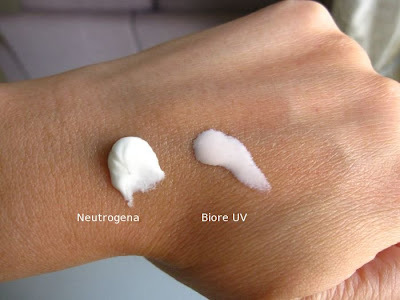 The SPF 50 version of this Neutrogena sunscreen is stable, but Neutrogena sunscreens are not recommended also because of their Oxybenzone content. While there have been suspicions of estrogenic effects with other chemical filters, oxybenzone is the only one that has been shown to actually be readily absorbed into the skin since tests revealed that it was present even in urine of test subjects. For outdoor activities, European sunscreens like La Roche Posay, Bioderma and Avene are recommended instead because they offer high UVA and UVB protection options. The Japanese PA index only indicates up till PPD 8 (PA+++), which is not exactly sufficient for high sun exposure. To present a stark contrast, Cetaphil SPF 50 sunscreen has a PPD of 28, Avene SPF 50 sunscreens have a PPD above 17 and Bioderma Photoderm Laser SPF 50+ has a PPD of 38. Japanese sunscreens are more suitable for low or moderate sun exposure for those not using ingredients like arbutin or kojic acid that can make skin sensitive to the sun. Their excellent lightweight textures do very well for that. Sorry about the long comment but as you can see I am very passionate about sun protection.I am quite saddened by how much companies can get away with just because sun protection is an area consumers are often not educated on. 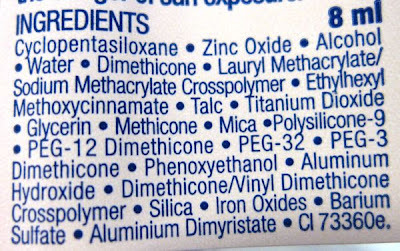 Sunscreens are the most important step in anti-aging and prevention of skin cancer, yet there are still so many sub-standard sunscreens being promoted by even large skincare giants at exorbitant prices for a product that one has to use 1.25 ml of on the face to get the labelled SPF and PPD. :X I hope you don't get annoyed thinking I go around looking for inappropriate forums to rant on or that I despise Japanese products - I check your blog often but seldom comment and I just had to cancel a trip to Japan because of the radiation situation. Thanks for the helpful and detailed explanation. I'm not an expert on sunscreen formulations and can only write based on my experience of using different sunblock lotions. It is a tricky field to navigate and the beauty companies don't make it easy for ordinary consumers. i second what SY says; i used to be out and about in the city a lot due to work and used LRP's anthelios on my face for a couple of years. it's a good lightweight sunscreen at a fairly reasonable price (rrp $30-$40+ depending on spf but up to 25% on regular discount). so take care under the sun all!